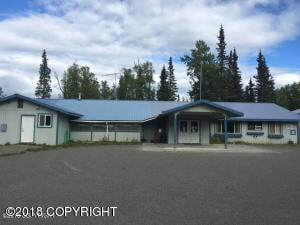 DESCRIPTION: This building is a large gathering place with an industrial size kitchen. Separate offices, all furniture included. 2 Large garages, plumbed for additional bathroom in garages. Make a great restaurant, church, clubhouse or office with parking. DRIVING DIRECTIONS: Kenai Spur Highway, just past MP 25 turn right on Island Lakes Road, property on the left about a mile in, look for real estate signs.